How very frugal I feel in the month of January. The pantry and freezer are still quite full, enough that I need to spend very little at the store. We've just had our fill of goodies and party foods, so we really have no desire to eat out. And the things that I do buy at the grocery store, such as oranges, have so many ways to get the most bang for our buck. Here's the candy that I made last week that was so yummy, and soooooo cheap! Candy made out the part of the fruit, that most people toss into the garbage or the compost. 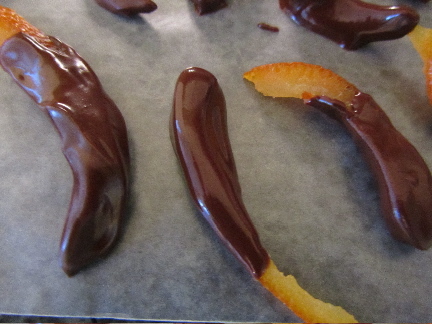 Candied orange peel, so yummy, so frugal. 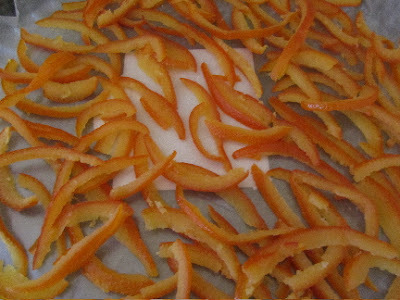 I follow the Joy of Cooking's recipe for Candied Citrus Peel, although I don't roll mine in powdered sugar as a final step, but spread the pieces of candied peel out on waxed paper, and allow to dry out for about 1 day. Some of this glazed orange peel we eat as is. The best looking pieces I dip in melted dark chocolate (stir in a 1/4 to 1/2 teaspoon shortening to aid in the dipping). Boxed up in a candy box, these make a nice small gift. 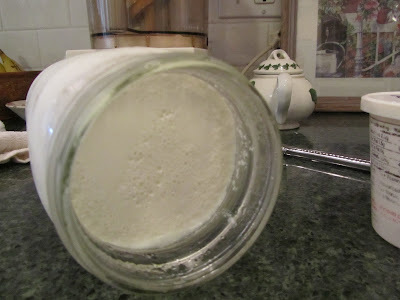 And the remainder, I chop to use in baking, as a substitute for dried or glaced fruit. Once chopped, I store it in the freezer, until needed. 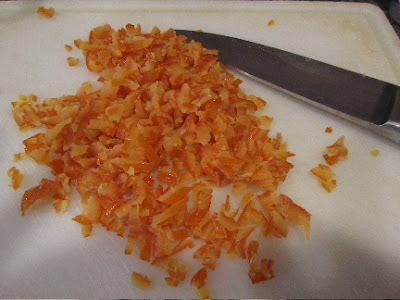 Chopped candied orange peel can be used in recipes calling for fruit cake fruit mix (the brightly colored glaced citron pieces and cherries). I make a bread at Easter that uses fruit cake mix, only I use a combination of chopped candied orange peel, chopped dried apricots, and chopped prunes from our plum tree. The bonus here is there are no weird colors. I never could get used to the green cherries my mother would add to fruitcake. There is one aspect of oranges that I don't care for, peeling them with my fingers. Peeling oranges seems to split the skin under my fingernails from the nails themselves -- ouch! 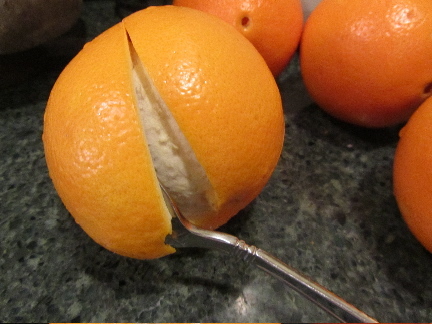 So I use a spoon to peel oranges. 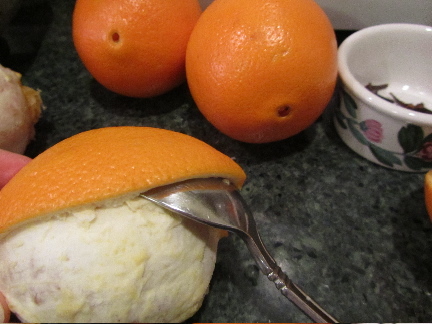 Here's how I peel an orange with a spoon. I score the orange, with a knife, just through the peel, into quarters. I take a tablespoon, flip it over, so the bowl side is up, slip it under the peel, and slide it around, loosening the peel from the orange. It's very quick and saves my fingernails. I now have an orange for eating, and orange peel all ready to slice for making candied orange peel. Now, if only there was a way to do something yummy with banana peels. I have never been a fan of candied fruit, but I've never tried the orange peel just by itself. Maybe, I give it a whirl. You may like the chocolate-dipped pieces best, if not a huge fan of candied fruit. I happen to love it. The chocolate ones remind me of a candy that my mom particularly liked, they were Sweet's Orange Sticks. Thanks for the peeling orange demo. I've got some seville oranges lined up for marmalade making. Another good use of peel. Do you make that across the pond? I love marmalade! I don't make a whole lot of it, as we have so much free tree fruit for jams and jellies, but I make a small batch each year. I've got a bowl of orange chunks soaking today, to make this year's batch of marmalade in the afternoon. I've never understood why you soak the orange quarters for 24 hours, but oh well, the recipe says to do it, so I do. I don't use Seville oranges, but whatever I happen to have, which this year is just navel oranges. Some years I add lemons or grapefruit to it. A friend of mine just made a batch of lemon marmalade, as that's what she happened to have. I'm going to get mine soaking today! I don't remember doing that stage last year, and nothing awful happened with the marmalade, so I'm not sure what purpose it serves...just to bring out the flavours more I guess. Sounds good! Yes, maybe it draws some of the flavors into the water. I did notice how fragrant the water was the next day. Ha ha! I guess it does seem like I really get my money's worth out of our oranges! LOL! Anywho, the chocolate-dipped ones are a confection. 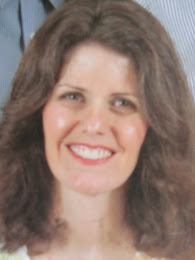 If you try them, let me know what you think.